This presentation was given at NBLUG.org on 2011-08-09. Since you're viewing this online, you'll probably want to swith to Outline mode, which will show you additional notes that are not visible in Presentation mode. Sections that are only visible in this outline / handout mode will have Notes: as the first line. These sections contain additional information, links, and commentary that isn't viewable in presentation mode. There are a wide variety of resources for learning more about Bitcoins; a good place to start is http://bitcoin.org, especially the wiki. Meet Alice and Bob. They want to make a transaction. Alice is a consumer. Bob has a widget that Alice wants. Alice has some Bitcoins. Bob is willing to take them as payment. Alice has a digital wallet, but it contains key pairs, not coins. 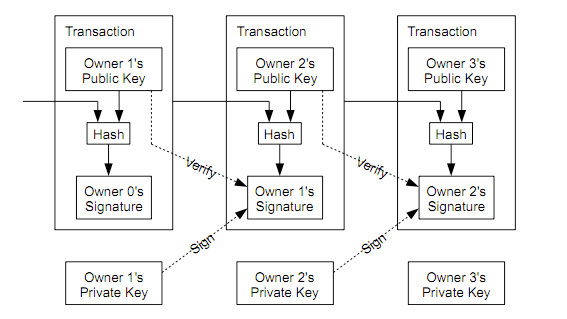 Alice knows Bob's public key and creates a transaction that she signs with her private key. The transaction is made public, confirmed over time, and kept forever. One of the best resources for the technical details behind Bitcoin is the original whitepaper by Satoshi Nakamoto. Brian Warner's talk was especially helpful in preparing these slides. 1 BTC is divisible to .00000001 places, commonly referred to as "1 Satoshi"
The IRC channels I polled were #eligius and #bitcoin with the question "In regard to the the value of Bitcoin in relation to other currencies, are you optimistic or pessimistic?". Every response I got back was "Optimistic", some with convincing personal arguements as to why. Common sense. It's a good thing. An interesting thought question is what would happen if ICANN used the .bit namespace themselves. The minimum time between updates are required is scheduled to increase at a future date. The mining profitibility chart mentioned above also shows the rates for Namecoin. The sections above are littered with links, so feel free to navigate to those areas or search this document for the subject you need more information on. As always, a good search engine is your friend. This presentation can be reused in any way with attribution.